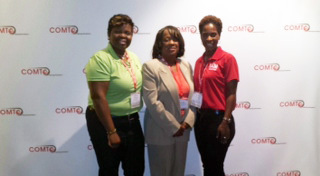 IAM General Vice President Diane Babineaux, center, is joined by, left, Regional Coordinator for TCU/IAM Training Services Department Nicole Burnett and Atlanta TCU/IAM Lead Field Education Representative Felicia Hill at the Conference of Minority Transportation Officials’ 43rd National Meeting and Training Conference in Atlanta. After being previously honored by the Conference of Minority Transportation Officials (COMTO) this past March, IAM General Vice President Diane Babineaux returned to the premier organization to share the IAM’s groundbreaking efforts to educate and train young workers in the transportation industry. 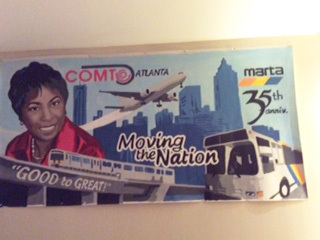 A poster at the Conference of Minority Transportation Officials’ (COMTO) 43rd National Meeting and Training Conference in Atlanta honors former COMTO President/CEO Julie Cunningham, whose tenure abruptly ended on June 24 with her passing. Highlights of the conference included a leadership summit, which brought together top transportation decision makers from the private and public sector. The conference also included a special tribute to former COMTO President/CEO Julie Cunningham, whose tenure abruptly ended on June 24 with her passing. Former U.S. Transportation Secretary Rodney Slater also gave a special tribute to former U.S. Representative and House Transportation and Infrastructure Committee Chairman Jim Oberstar (D-MN) who died May 2. COMTO was created in 1971 to ensure a level playing field and maximum participation in the transportation industry for minority individuals, businesses and communities of color. It has 39 chapters throughout the United States. Members include individuals, transportation agencies, academic institutions, industry non-profits and Historically Underutilized Businesses (HUBs) from every facet of the transportation industry: from highways and roads to mass transit systems; from subways to rail systems; and from port authorities to airports.